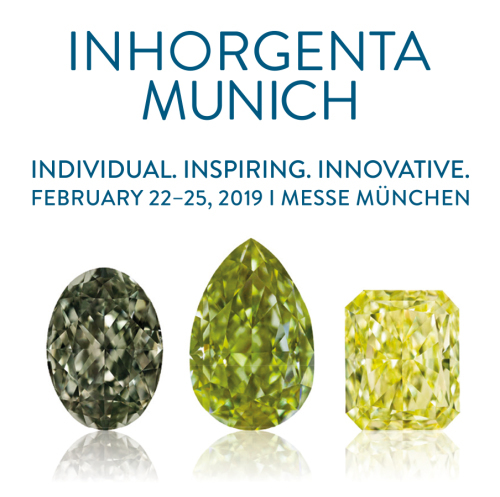 This year, once again, we will be exhibiting at INHORGENTA MUNICH. We look forward to your visit and an opportunity to share our carefully selected assortment of goods with you during a personal consultation. You can find us in Hall C1, Stand 309 from 22 – 25 February 2019. Although Natural Fancy Coloured Diamonds have today become a permanent feature in the jewellery industry, there are still often times questions concerning these colourful and unique stones. In this newsletter, we have compiled some of the most frequently asked question and provided their answers to help you understand these stones better. - What Makes Natural Fancy Coloured Diamonds So Special? - How Many Diamonds out of the World’s Production Are Coloured? - In What Colours Are Diamonds Available? - Which Colours Are the Most Common for Diamonds? Which Colours Are the Rarest? - Where Are Coloured Diamonds Found? - What Does the Prefix "Fancy" Mean? - Do Coloured Diamonds Have More Inclusions Than Colourless Diamonds? - Which Cuts Are Most Common in Coloured Diamonds and Why? - What Quality Certificates Exist for Natural Fancy Coloured Diamonds? - How Is the Value of Coloured Diamonds Measured? - How Should the Price of a Natural Fancy Coloured Diamond Be Calculated? - Can Natural Fancy Coloured Diamonds Be Heated or Will They Lose Their Colour? - Are Pickling Solutions, Ethanol and Epoxy Solvents Harmful? - What Makes Kulsen & Hennig and Dominik Kulsen AG Different from Other Companies? What Makes Natural Fancy Coloured Diamonds So Special? The special charm of Natural Fancy Coloured Diamonds comes from the fact that no two stones are ever the same; each diamond is unique. Jewellery designed to include Natural Fancy Coloured Diamonds easily stands out from ordinary goods sold by the competition. Offer your customers something truly exceptional thanks to the wide selection of colours and shapes available and the many creative design options this diversity allows. In addition, with a wide range of price categories, there is something for every budget! 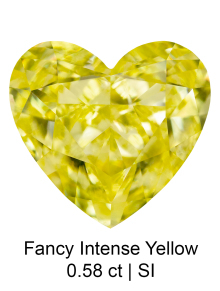 Take a chance on Natural Fancy Coloured Diamonds – your customers will be delighted! How Many Diamonds out of the World’s Production Are Coloured? One out of every 10,000 diamonds mined is coloured! In What Colours Are Diamonds Available? The diamond is the gemstone with the widest colour spectrum. In fact, diamonds occur in every colour possible. Pure colours are rather rare, and mixed colours are much more common. Some colours, such as pure red, blue or green, are so rare that they are virtually unavailable on the market. Diamonds of these colours are typically auctioned off at top prices to enthusiasts and collectors. 1. Deposits of foreign trace elements in the carbon crystal lattice. For example, yellow diamonds contain nitrogen deposits, and in blue diamonds, boron or hydrogen atoms can be detected in the crystal lattice. 2. Shifts in the atomic grid caused by pressure during the diamond’s formation make the diamond appear either brownish or pink. For more detailed information on the topic of "colour causes of diamonds", have a look at the back of our colour cards. Which Colours Are the Most Common for Diamonds? Which Colours Are the Rarest? 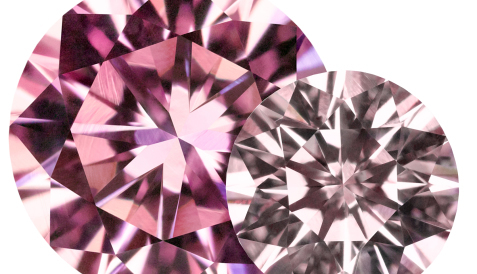 The rarest diamond colours are red, blue, green and pink. A beautiful and less expensive alternative to pure green diamonds are our olive stones, which present a mixed colour of green, yellow and brown. 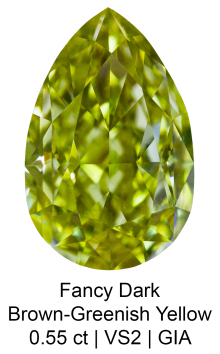 A special feature of certain olive diamonds is the chameleon effect! Read more in our Chameleon Diamonds article. 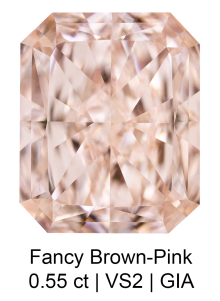 For an interesting alternative to pure pink diamonds, we like to recommend our "Fancy Brownish Pink" stones. They possess a warmer colour that can be described as "old rose". They are also less expensive than pure pink stones because of their brown secondary tone. The most common diamond colours are yellow, champagne and grey. The very popular champagne coloured diamonds are now considered a classic among Natural Fancy Coloured Diamonds. Where Are Coloured Diamonds Found? Although Natural Fancy Coloured Diamonds can be found wherever colourless diamonds are found, the majority of champagne and pink diamonds come from the Western Australian Argyle mine. The mine also produces very rare red diamonds. What Does the Prefix "Fancy" Mean? The prefix "Fancy" is only used to describe a diamond if its colour produces a certain effect at a distance and it can be clearly identified as a coloured diamond. The term "Fancy Colours" refers to all the colours in which diamonds can occur and which are not to be found on the traditional colour scale (D to Z) for colourless, tinted diamonds. Do Coloured Diamonds Have More Inclusions Than Colourless Diamonds? No! The inclusions present in a diamond have nothing to do with its colour. Although it is true that impurities affect the colour of a Natural Fancy Coloured Diamond, they do not do so as inclusions, but on the atomic level. Hence, flawless stones can be found among Natural Fancy Coloured Diamonds just as they would be found among colourless diamonds. In contrast to colourless diamonds, however, inclusions play a less important role in the pricing of Natural Fancy Coloured Diamonds, as the colour of the diamond comes first. Which Cuts Are Most Common in Coloured Diamonds and Why? Colourless diamonds are cut to minimize the stone’s colour as much as possible; in the case of Natural Fancy Coloured Diamonds, however, just the opposite is true. The cut will focus on maximizing the colour intensity of the diamond even more. Since the classic round brilliant cut was developed to reveal as little of a diamond’s colour as possible, it is not well suited to coloured diamonds. For this reason, Natural Fancy Coloured Diamonds are more likely to be found in fancy cuts. Cuts such as the radiant, oval or cushion keep colour particularly well and even emphasize it, while the baguette or emerald cuts - similar to the brilliant cut – enhance a stone’s colour less. In addition, these step cuts should only be used for rough stones that have excellent clarity, since even the slightest flaw would be visible to the naked eye. For these reasons, Natural Fancy Coloured Diamonds are mainly found in radiant, oval or cushion cuts. Princess-cut coloured diamonds are also harder to find. More often, the square radiant cut is used as a common variation because it better intensifies the diamond’s colour and, thanks to its angled corners, it is not as fragile as the princess cut is. A brilliant cut Natural Fancy Coloured Diamond requires a much more colour intense rough diamond to achieve the same colour intensity as a cushion cut stone. For this reason, brilliant cut Natural Fancy Coloured Diamonds are also more expensive than those in fantasy cuts with the same intensity. What Quality Certificates Exist for Natural Fancy Coloured Diamonds? All the laboratories we know of issue quality certificates for Natural Fancy Coloured Diamonds. Some of the best known include the GIA, the HRD, the IGI and the DPL. The most commonly encountered quality certificates for Natural Fancy Coloured Diamond come from the Gemological Institute of America (GIA). Since we buy and sell worldwide, we have most of our stones above 0.40 ct certified by the GIA. In spite of this, however, we do not provide a certificate for our champagne coloured stones. 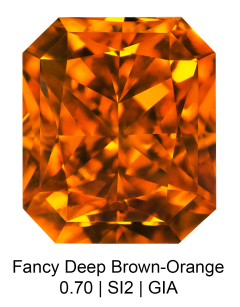 The GIA and other laboratories grade brown diamonds by the name of the colour, “Yellowish Brown” or “Orangy Brown”. We have chosen to adhere to the more detailed grading system developed by the Argyle mine which divides stones by colour intensity on a scale ranging from C1 – C7 (light champagne though dark and cognac). We are, of course, happy to provide in-house appraisals for larger champagne-coloured diamonds which describe the stone’s colour, weight and clarity. How Is the Value of Coloured Diamonds Measured? The value of a coloured diamond is measured by the rarity, the intensity and the purity of its colour. For example, frequently occurring diamond colours like champagne are much less expensive than rarer colours like pink and blue. Purity of colour refers to the absence of a second colour or secondary hue. That said, however, the presence of a secondary colour does not necessarily reduce a stone’s value. 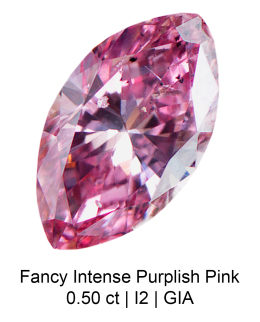 If, for example, a champagne-coloured diamond possesses a rare secondary colour, like pink, the stone’s value will increase. Further information on mixed colours can be found in our newsletter "Mixed Coloured Diamonds". Further information on pricing can be found in our newsletter "Pricing for Natural Fancy Coloured Diamonds". How Should the Price of a Natural Fancy Coloured Diamond Be Calculated? On that question, we can only offer you some advice. The days when the price of diamonds was calculated by a factor of 2 to 3 are definitely over. Today, many providers on the Internet sell diamonds to end-customers at reasonable prices. The market for Natural Fancy Coloured Diamonds, however, is a little less transparent. Coloured diamonds are not often offered on Internet, so it is more difficult to compare prices. In addition, Natural Fancy Coloured Diamonds should never be bought based the certificate alone. The colour of a diamond is critical to determining its price and can vary too much. Certificates can only provide a point of reference as to the colour. You should always see a stone in person before buying! The larger and more expensive a stone, the lower the pricing factor should be. Due to fewer comparison opportunities, the price of Natural Fancy Coloured Diamonds can be calculated more liberally with a clear conscience. In the end, however, one question remains: Do you want to sell the stone or not? Can Natural Fancy Coloured Diamonds Be Heated or Will They Lose Their Colour? Natural Fancy Coloured Diamonds can be heated gently and slowly just like colourless diamonds. That said, however, they should never be in direct contact with the flame and under no circumstances should they ever be quenched. It is useful to coat the diamonds with a glaze to stop oxygenation and prevent the diamond from burning or becoming milky. 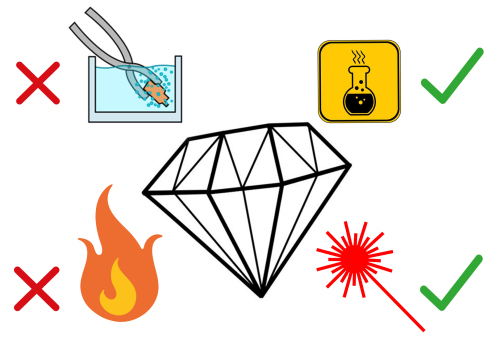 Also, unless absolutely necessary, you should avoid soldering diamond jewellery and use laser welding instead. Caution is advised, however, when handling treated or irradiated diamonds. These stones may only be heated to a maximum of 200° - 400 ° C, depending on the colour. At higher temperatures, they will lose their colour. Are Pickling Solutions, Ethanol and Epoxy Solvents Harmful? Black diamonds should definitely not be placed in galvanic baths. Due to their porous surface, they would partially absorb the metals, making their surface irrevocably dull and greyish. What Makes Kulsen & Hennig and Dominik Kulsen AG Different from Other Companies? The Kulsen & Hennig GbR and Dominik Kulsen AG companies have been active in diamond trading in Europe and Switzerland for over 25 years and have always specialized exclusively in Natural Fancy Coloured Diamonds. We select our stones with the utmost care. Using our “Sortoscope”, a device similar to a microscope that allows us to efficiently examine and sort even the smallest diamonds, we inspect each stone, even those as small as 0.9 mm, to check for clarity and quality. Any stones that are not up to our standards are sorted out and discarded. Over the years, we have put together a substantial inventory that allows us to respond immediately to our customers’ needs without having to spend time searching for stones on the market. Typically, our customers can expect to see a selection of stones to choose from one day after their request. For very special and rare stones that we might not keep in stock, we maintain an extensive international network allowing us to find exactly what the customer is looking for quickly. The INHORGENTA trade fair is THE opportunity for you to discover our wide range of Natural Fancy Coloured Diamonds in person. You are of course also welcome to visit us during the year by appointment in our offices in Berlin or Winterthur. Looking forward to seeing you at INHORGENTA! Plan on receiving our next newsletter early summer 2019. The already published newsletters can be found in our Newsletter Archive.